Looking for a job in LaSalle County Illinois? This LaSalle County Illinois job guide is a resource for job seekers looking for legitimate employment opportunities in the region with an emphasis on government positions, top healthcare employers, public school careers, and major job boards. LaSalle County Illinois periodically posts job openings. Open positions found on this review date had included Staff Nurse. Check for updates. Ottawa's human resources page provides information about civil service testing and lists employment opportunities and applications on the right column of their page. Peru posts open positions when vacancies become available. During review there had been an opening for a Building & Zoning Inspector. Check for updates. Eakas produces exceptional products that are both functional and decorative to meet the diverse needs of the automotive industry. Carus Corporation periodically posts open positions in LaSalle. During review there were open positions for Maintenance Apprentice and Quality Control Technician. Target offers some of the best careers in retail. Peru Mall has numerous stores. You can check the main mall employment page or check with local stores to inquire about employment listings. OSF HealthCare Saint Paul Medical Center is a 25-bed Critical Access Hospital located in Mendota, Illinois. Open positions found on this review date had included Respiratory Therapist (CRT/RRT), Registered Nurse RN Emergency, Registered Nurse RN ICU, Registered Nurse RN Specialty Clinic, Registered Nurse RN Family Practice, Registered Nurse RN Emergency Department, Medical Office Assistant, Clinical Lab Scientist MT, Medical Technologist, Athletic Trainer, and Advanced Practice Provider - Hospitalist. More than a great place to work, IVCH offers a great place to live and thrive. With a location in the heart of the Illinois Valley, you'll experience all the benefits of small town life, plus the convenience of being close to major metropolitans areas like Chicago. Occupational Therapist, Physician Assistant, Program Aide, Controller, Licensed Practical Nurse LPN, Emergency Room RN, ICU Registered Nurse, ICU Nursing Jobs, Orthopedic Nursing Jobs, Registered Nurse RN Surgical, RN Scrub, Certified EKG Technician, Certified Medical Assistant, Certified Surgical Technologist, Med Tech, Medical Technologist, Occupational Therapist, Physical Therapy Assistant, Polysomnography Technologist, Radiologic Technologist, Respiratory Therapist, Speech Language Pathologist, Medical Technologist or Medical Laboratory Technician, and more. St. Margaret's Hospital is a 69-licensed bed facility located in Spring Valley. Careers available may include positions such as Biller Medicare/Medicaid, Medical Biller 3rd Party Insurance, Certified Medical Assistant or LPN, Charge Nurse, Clinic Nurse, Clinic Nurse Practitioner, Registered Nurse RN, Licensed Practical Nurse LPN, Certified Nursing Assistant CNA, Cook, Rehab Services Assistant, Dietary Aide, DME Clinician, DME Service Tech, Driver, Environmental Services Aide, Cardiopulmonary Technician, Maintenance Mechanic, MRI Tech, Nurse Practitioner, Office Assistant, Patient Accounts Clerk, Phlebotomist, Physical Therapist, Physical Therapy Aide, Radiology Tech, Registration Clerk, Registered Nurse RN, Registered Nurse ICU, Hospice Nurse, Emergency Department RN, Registered Nurse Med / Surg, Surgical Scrub Tech, Switchboard Operator, and Transcriptionist. Mendota Lutheran Home features a variety of healthcare jobs that feature opportunities to serve elderly and disabled. During review there were open positions available for Part time Dietary Aide, Nursing jobs to include Registered Nurse RN and Licensed Practical Nurse LPN, Certified Nursing Assistant CNA, and Maintenance positions. Horizon House of Illinois Valley provides a variety of services to adults with disabilities. Horizon House of Illinois Valley's work sites in LaSalle, Peru, Spring Valley and Mendota. Liberty Village of Peru offers retirement, assisted living, and skilled nursing services. Here you may find a variety of opportunities including nursing jobs, Administrator, Social Services, Physical Therpist PT, Occupational Therapist OT, SLP, PTA, COTA, Bookkeeping Jobs, Marketing / Sales Jobs, Clerical Jobs, Activities, Hair Dresser, Dietary Jobs, Maintenance, Desk Attendant, Housekeeping Jobs, and Laundry Attendant. North Central Behavioral Health Systems periodically hires Mental Health Specialists, Behavioral Health Therapists, and Intensive Home - Community Based Youth Services Specialists. LaSalle-Peru Township High School District 120 had employment listings on this review date for Debate Team Advisor, Baseball Coach, CNA Health Occupations Teacher, llinois Valley Entrepreneur Opportunities (IVEO) Teacher, and Automotive Repair Teacher. 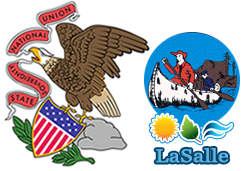 Regional Office of Education La Salle #35 has a high volume of ongoing employment opportunities. Here you may fin open positions such as Kindergarten Teacher, Early Childhood Teacher, Paraprofessional, Custodial Jobs, School Psychologist, Special Education Teacher, 5th Grade Teacher, School Custodian, Pre-K Teacher, 2nd Grade Teacher, Math Teacher, School Bus Driver, 3rd Grade Teacher, 4th Grade Teacher, 1st Grade Teacher, High School Social Studies Teacher, PE Teacher, Special Education Teacher Autism, Occupational Therapist, ELA Teacher, Social Studies Teacher, Pre-K Special Education Teacher, School Guidance Counselor, Physical Education Teacher, Assistant Principal, Secretary, Instructional Aide, School Bus Monitor, Educational Assistant Position, Elementary Principal, District Bookkeeper, Special Education Teacher Assistant, Pre-K Classroom Aide, Part Time Preschool Teacher's Aide, Early Childhood Special Education Teacher Assistant, Paraprofessional Behavior Interventionist, School Crossing Guard, and more. LaSalle and Putnam County Educational Alliance for Special Education had open positions such as Music Teacher, Teacher of the Visually Impaired, Elementary Speech and Language Pathologist, Deaf / Hard of Hearing Interpreter, and Individual Paraprofessional. Mendota Township High School District 280 provides employment information and applications. Ottawa Elementary School District was hiring for the positions of Substitute Teacher and School Bus Driver on this review date. Check for new listings. Jobs found on this review date included Special Education Teacher. Check for updates. Streator Elementary School District 44 had openings for Part-time Para-Professionals and PK Bilingual (Spanish) Teacher. Illinois Valley Community College located in Oglesby often has open positions available for faculty and support staff. Some positions found on this review date included Information Technology Services jobs, Custodian, Criminal Justice Instructor, Programmer Analyst, Computing Audio-Visual Specialist, Professional Tutors, Part-time Instructors, Certified Nursing Assistant (CNA) Instructors, and Dental Assisting Instructors. The La Salle News Tribune Classifieds Employment is another good resource for regional listings. LaSalle's trends that are currently affecting the economy and will continue to shape the job market for the rest of the decade. This include Industries With the Largest Wage and Salary Employment Growth and Occupations With the Largest Employment Growth. The Mendota Area Chamber of Commerce is a good resource for searching area employers by using their directory. Monitor the State of Illinois web-based electronic hiring system for job openings in LaSalle County. This Worklooker directory includes Aurora, Joliet, Yorkville, Caterpillar Aurora, Menards Distribution Center in Plano, KishHealth System Valley West Hospital - Northwestern Medicine Jobs, Edward-Elmhurst Health Center - Oswego, Hillside Rehab & Care (Helia Healthcare) - Yorkville, Newark Community Consolidated School District 66, Oswego Community Unit School District 308, Yorkville Community Unit School District 115, and more listings.